Congressman Danny Davis helps appellate court Judge Nathaniel Howse Jr. (center) explain the proposed Lethal Violence and Order of Protection Act at a town hall meeting held April 7. State Rep. La Shawn Ford and Rep. Camille Lilly say changes need to be made to a gun control measure pending in the Illinois General Assembly before they can support it. 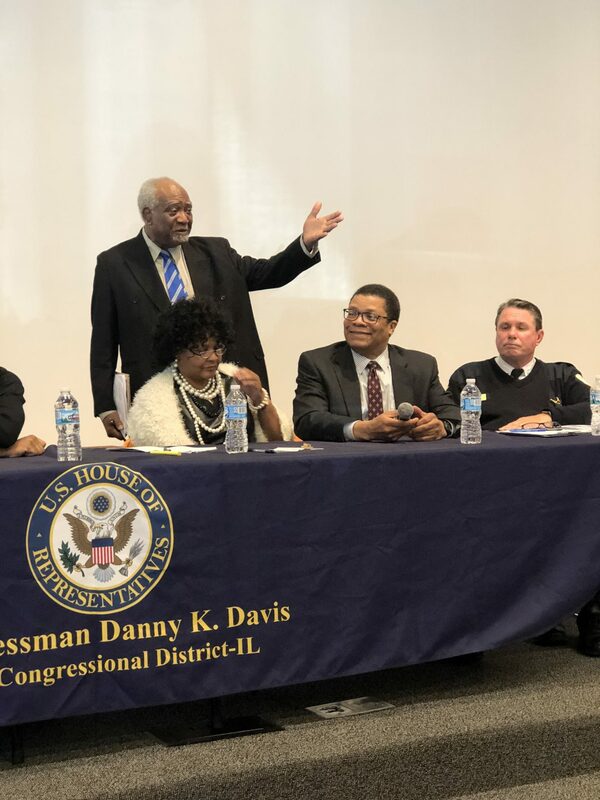 The two lawmakers, who represent Austin in the Illinois House, voiced concerns about the proposed Lethal Violence and Order of Protection Act during a town hall organized last weekend by Congressman Danny K. Davis. The bill would allow the filing of an affidavit alleging someone poses an “immediate and present danger” to himself or others, and has access to a firearm. Police would be able to retrieve the weapon as well as the owner’s FOID (Firearm Owner’s Identification Card) if a court grants an emergency lethal violence order of protection. Appellate Judge Nathaniel R. Howse Jr. of the First District, 4th Division, mentioned the bill, HB 3160, during the town hall that focused on gun violence. “I just read through a transcript the other day where a man went and shot his wife in front of his two kids. If this law had been in place, the court could have taken those guns away,” Howse said. The bill has been approved by the Illinois Senate and is pending in the House. Among its opponents is the Illinois State Rifle Association, according to Capitol Fax. Supporters include the Illinois Council Against Handgun Violence. The only way he would support the legislation is if language is added to give courts the ability to remove an unfounded petition from the record of a wrongly accused person. “If it is unfounded and it stays on their record, we’ve just put a strike next to their name for no reason. They will never be able to get a job,” Ford said. Lilly, who represents the 78th District in the House, said law enforcement has voiced concern about what happens in cases when an affidavit is filed against someone with a history of mental health problems but that information isn’t available to police. Lilly said the Illinois Legislative Black Caucus is suggesting tweaks the bill so it can lend its support; both she and Ford are members of the caucus. Ford said he fully supports another piece of gun-related legislation, the Paul Bauer Act, named after Chicago Police Commander Bauer who was shot to death Feb 13 while trying to apprehend a suspected robber. The legislation would ban the sale of body armor and high-capacity gun magazines to those who are not police officers, members of the armed forces or licensed security officers. About 30 West Side Chicago and Oak Park residents discussed the issue after the event aired on CNN.